Famous synth manufacturer Korg has released the schematics (get them here if you don’t like to fill out forms) for their wee little Monotron for all to see and use! 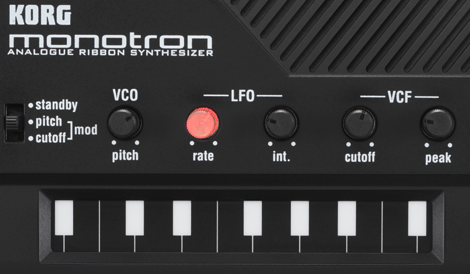 This is great news for anyone looking to build up a synth from scratch or to circuit bend their existing monotron. The filter circuits alone would be fun to add to an existing electronics setup. Granted there are already many examples of monotron mods out there, but that shouldn’t stop you from experimenting with your own variations. Now with the schematics you can make fundamental changes to the architecture of the synth all from the comfort of your own CAD software. Want more oscillators? Distortion? It’s all out there for you to explore. We’re very interested to see how far people will run with this. And big ups to Korg for recognizing the value of hacking! Nice! Nothing too unfathomable in there. The one thing that shouts ‘unobtanium’ is the way they drew the Q1 in the VCO, but from what I can tell it’s just two discrete transistors in one package. The IMX9 was probably used as a cheap way to get a matched and/or thermally coupled transistor pair, although there’s no mention of matching in the datasheet. You could trade circuitry for code, but I think that misses all the appeal of the Monotron. That’s the first thing that caught my eye as well. A quick google search of IMX9 yields a datasheet showing it’s just two discrete transistors in a single package. @Digitalundernet – You could do it… just don’t try -this- circuit for your first attempt. Buy a kit synth from getlofi..
… you get support if you need it..
… those kits are small enough that you’ll learn what they do. @Digitalundernet if you want to make your own synth look at either the midibox.org midibox SID or MFOS soundlab. Never considered the idea of recreating the schematic in eagle and then modifying it though, thanks for that idea hackaday! Those back to back transistors are fairly common in amplifier design. It’s usually for temperature stability I think. If you’re new to analog circuitry, don’t even think of trying to build this thing all from scratch at once using only a circuit as a reference. Build simple modules one by one, see how they work first, then join them together. They sell modules to a full blown analog synth. I wonder if anyone could identify for me where the VCF ‘starts’. I’d love to have this filter as a stand-alone module. Is the input at the junction of Q13 and Q14, or do I have to go back further still? Wanna beat thomas dolby at his own game? Check out the japanese equivalent of PAIA – Gakken. Except they come pre-assembled. PAIA… great guy[z], legendary, amazing company… but basically the entire product line should have been rendered to silicon years ago. Bring back the jolt, and get us synthetic patch cords so we can change configs on the fly. The newest products are basically 20 years old. I like classics, but there’s a world of new users out there who want and need features like sampling and cascading reverb units with multiple taps. Come on PAIA, you can do it! Give us the weird CV analog synth equivalent of a quad rack setup using surface mount components in a bento-box form factor! Give us an eeprom that will save patches… we know you’re not dead yet! @Rich Decibels: start with the Line In jack, or the point marked as VCO (TP8). Following it is a buffer amp IC4D which you would need anyway and then left to right there’s the VCF. But you also need the wire marked [cutoff> near IC4B to control it, I guess. There’s also VCF gate input to IC4A. Fun stuff, adding it to my endless list of things never to be done. oh wow I didn’t even know this synth existed. YES!!! Note that there are multiple connections to the “Bias” net generated by IC2B (text search the PDF). This is a floating virtual ground enabling the use of single supply rail op amps.